My interest in orbs dates back to Oct.28th, 2013 when I took a photo of my dog who had miraculously recovered from an autoimmune disease. I wanted to send the photo to the vet as proof that Mimi had survived against all odds. When I looked at the picture I saw a bright ball next to her on the ground. 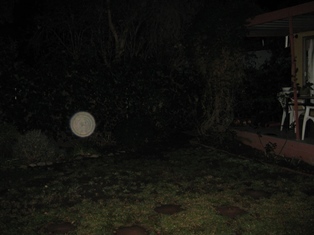 I immediately connected that image to the "orbs", I have seen on a documentary on TV. Later, I took some more photos (around Halloween) I was amazed at how many and different in size and brightness orbs I caught in my backyard. It is the place where I can photograph them and they are absolutely not dust, water,or anything else that some people claim them to be. They are real entities of unknown kind. They seem to change their position, they also have different colors-white, green, orange. My backyard is the place where I can catch the images of those mysterious beings. I can take pictures of them when I wish to see them, and it is usually dusk to night time. I have attached 4 of the photos I have taken. I am excited and thrilled by the wonders of the universe.